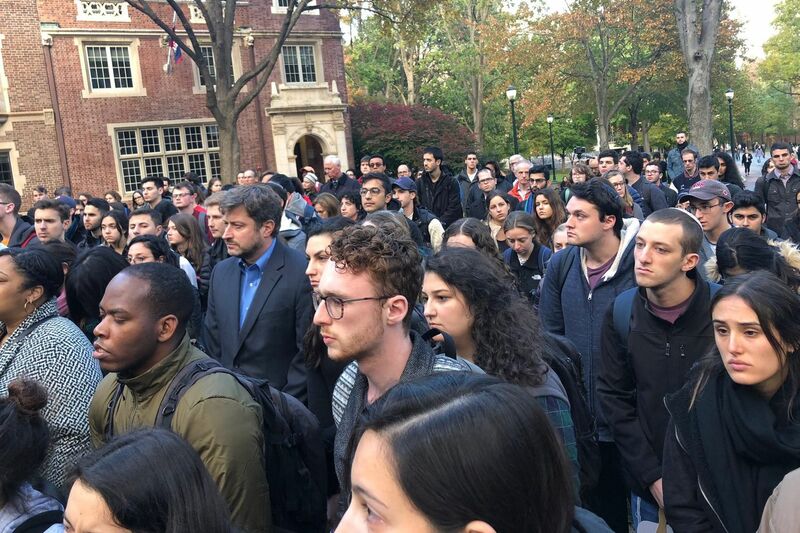 Mourners gather at a vigil hosted by Penn Hillel for victims of the Pittsburgh shooting. There's no confession in Judaism, at least not in the way that Catholics experience it when we walk into a holy phone booth and unburden our sins to a priest on the other side of a screen. In Judaism, I learned, confessions are more personal — between you and God. No middleman. I was doing plenty of talking to God the other day at a vigil on the Penn campus for the Pittsburgh synagogue shooting victims. Or more precisely, railing at whatever higher power I've found to be a little too hands-off when it comes to this world out-awfuling itself on a daily basis. But a couple of days later, I was also treating Rabbi Levi Haskelevich from the Chabad House at Penn as if he reported to the Vatican. Forgive me, Rabbi, for dragging you into my personal wrangling between good and evil. As I told the good man, I happened to be at Hillel House, a center for Jewish students at Penn, a few days before the mass shooting. I was there to talk to Troy Harris, one of Hillel's cooks, about the latest fund-raising effort to get the licenses and permits necessary for the kosher food truck he's been trying to get on the road with the help of many of the Jewish students he feeds. We probably could have wrapped up the conversation a lot earlier than we did, but I was in no rush; it's a welcoming, comfortable space with students grabbing something to eat at the dining hall, studying, warmly greeting one another and Harris as they went in and out of the building. "Where are you going?" one student asked another dragging luggage behind her. I thought of them on Saturday, when a gunman screaming "All Jews must die" walked into the Tree of Life synagogue in Squirrel Hill and murdered 11 people, including Penn alumnus Jerry Rabinowitz. My heart broke on Monday, when I returned to commiserate with Harris and learn how the fund-raiser had surpassed its goal in just a few days, thanks to many Jewish donors. It was earlier in the day than my last visit, and many of the students were still in class, but I was struck by how different the space felt. There was still the large sign welcoming people to Penn Hillel: "These doors are open to people of all faiths or none, Come in. Rest. Eat. Seek. Go in peace." But there was also a security guard asking every student for ID, insisting every visitor sign in. "We have to keep everybody safe," the guard said. I walked to the vigil nearby, hosted by Penn Hillel, getting angrier and angrier with each step over the evil that had pierced such a safe space. I settled into my anger like so many of us these days; like a second skin, when I found myself in the middle of a crowd of mourners who, one by one, talked about goodness, putting goodness in the world, committing good deeds. I wondered, Is there a way to "weaponize" good the way so many weaponize evil? Rabbi Haskelevich was one of the people who spoke about goodness at the vigil, so I called him. He was not buying my crude attempt for easy answers or sound-bite social justice. But he heard me wrestling for answers. So he listened. I confessed that I was ashamed of my anger as I stood in the middle of the crowd at the vigil as people from different backgrounds and faiths, who had every right to be angry, called instead for goodness. And yet, I said, I couldn't let it go. I wasn't sure any of us should — anger seems the most fitting reaction to the insanity that seems to be swallowing us whole. No one should feel ashamed for feeling angry, Rabbi Haskelevich assured me. Anger signals that people aren't desensitized, that they haven't become numb or indifferent. There is a place for anger — especially when it leads to action. But just as I was feeling redeemed, he challenged me on a point that I'd thrown out almost as gospel. He's not convinced the world is getting worse. And proof of that is right there in the good people with good hearts and good intentions who are angry over injustice — so angry that they will not let it stand. "We're focused on a lot of evil," he said, "but I think the focus on evil is a sign that it's less tolerated. If it's less tolerated, that means the world is getting better." So get angry about the shooting of congregants at the synagogue and of two black people by a white gunman at a Kroger supermarket in Kentucky a few days before that. Get angry at families being separated and children being caged and the toxic culture of sexism and racism and partisanship. If our newspapers and Twitter feeds and TV screens are filled with people screaming, "No more!" then none of us should be so quick to write this world off. If righteous anger is news, he said, there is hope.